Nick-N-Willy's Take-N-Bake Pizza franchise business opportunity. Free Nick-N-Willy's Take-N-Bake Pizza business franchise information. Nick-N-Willy's World Famous Take-N-Bake Pizza is a franchise opportunity that's perfectly timed for success. 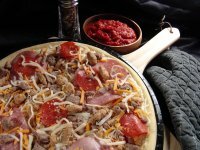 Not only has take-N-bake been called "the next mega-trend in pizza" according to Pizza Marketing Quarterly, but Nick-N-Willy's incredible quality and unique recipes are proven winners in the marketplace. Customers love the quality and convenience of pulling a delicious Nick-N-Willy's pizza hot from their own oven…on their schedule. Always hot. Always fresh. We make it. They bake it. Previously Nick-N-Willy's franchise owners had only the option of purchasing the combined restaurant and carryout concept, the Take-N-Bake Restaurant (TBR) model. While the TBR remains a popular franchise model option, the new Take-N-Bake Outlet (TBO) aims to accommodate franchise owners' desires for a carryout only concept, with no baking or dine-in on premises, including a lower initial investment. A winning team. Managed by experienced, successful franchisors who know what it takes to win because they've done it before. Low cost of entry. One of the most affordable franchise food operations in the country. Conveniently fills today's consumer needs. Take-N-Bake pizza uniquely satisfies consumers' desire to create a delicious, family meal from the oven, even as it fits into their increasingly time-pressured lives. Broad appeal. 93% of Americans eat at least one pizza per month, according to Parade magazine. That's a lot of pizza! Award-winning recipes. Nick-N-Willy's pizzas have been winners of over 10 "Best of Boulder" awards in our founding market of <?xml:namespace prefix = st1 ns = "urn:schemas-microsoft-com:office:smarttags" />Boulder, Colorado. Plus, we were just named reader's choice for "Best Take-out Pizza" by Denver's leading magazine. We want you to continue the high standards we have set! Specialized methods. Our systems are designed so making a perfect pizza is easy using our Wallinator®, our invention for keeping all the ingredients on our pies stacked high and perfect. World-famous flavors. Tastes from the sublime to the sophisticated, with such signature recipes as The Outback, The Aegean® and The Big Kahuna, to name a few. Unique selling proposition. This is gourmet pizza made a unique way. No pizza is as fresh and flavorful as a Nick-N-Willy's hot out of a customer's own oven, or a hot baked personal pizza from our restaurant. This isn't cold, soggy delivery pizza. That's why customers keep coming back to us every time! Professional support systems. Professional training, opening assistance, ongoing support, marketing calendar, national turnkey supplier, national food purchasing clout... and more. We want you to join our family of successful franchisees! To learn more about the Nick-N-Willy's Take-N-Bake Pizza franchise opportunity, simply complete the form below.